If you can bring it to me that is the best however if you can only send it to me a courier service is available for the safe return of your machine. As this is a home based business, its best to call to make an appointmen­t first, thanks Paul. Hi there, my name is Paul Sheffield and I have been repairing domestic Sewing machine and Overlockers in Auckland for more than 40 years. 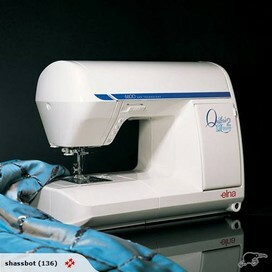 I started the "Greenlane Sewing Centre" 25 years ago and was an agent for brands like Elna, Brother, Pfaff, Husqvarna, Babylock, Singer, Toyota, Juki and Riccar. I was in Greenlane until it was turned into a car yard 15 years later, so I continued from my home in One Tree Hill until I retired from the retail side. I still service and repair domestic Sewing machine & Overlockers for shops in the greater Auckland area and would like to offer my services direct to you, just read my reviews below. I Have been trained by BERNINA, ELNA, PFAFF, JANOME, HUSQVARNA, BROTHER, SINGER and Baby Lock technicians over the years plus service brands like Juki, Bernette, Toyota, Riccar & Globe. Paul was excellent in his advice and also in providing a very prompt service. I had initially sent my machine to another (recommended) technician and finally gave up after 7 months and lots of promises (and absolutely nothing done to it). I was very relieved that Paul dealt with my machine so quickly (within a week) - I should have gone to Paul first up (will certainly be doing so for any future requirements). Paul is just brilliant - if he can't fix it then probably nobody can - he fixed the foot of my machine when my own dealer said it couldn't be done. And he's honest and fair with reasonable prices too. Bought my first machine from him well over 30 years ago and only recently "discovered" him again. I was so excited. He fixed my machine in less than a week. I was delighted with the price too. A+ for both technical skills and honest business dealings. Paul is awesome! Easy to contact, friendly, and highly knowledgeable. Has fixed two machines for me, my own and my mothers, both work like new again! I appreciate the honesty on other/older machines that can't be fixed. Will continue to bring my machines to Paul. I'm a very happy customer! Paul is awesome!! highly recommend for good honest opinions on your machine and advice to boot, I learnt something new that I had never been taught by anyone!! Thank you for your time and advice, much appreciated! I popped in to see Paul with a troublesome overlocker which had supposedly been repaired by someone else. He was so kind and very generous with his time, looking at my machine then and there and making a few adaptions to maximise it so i could take it home for my daughter to use before sending it back to get fixed. Thank you so much! This gentleman is a true gem. I can't recommend him more highly! Paul gave expert advice on my machine which was not worth repairing. He sold me another machine. I had that in four days despite living miles from Auckland. An honest, professional man who is an expert in machines. Thank you very much Paul. The new machine is wonderful. Paul is very knowledgeable, quick, up-front, pleasant... and dealt with my 46 year old Elna really efficiently and effectively. HIGHLY recommended. Thank you for extremely professional and obliging, honest service. I posted a broken foot control to Paul on a Monday and had it back by Thursday, all much better than new!! Very reasonable price to be fixed - just as he said. HIGHLY recommended to all who have any machine repairs or queries. Thank you so much. Purchased a machine recently and am exceptionally happy with it. Paul was very helpful in advising me about any details/questions I had. A very efficient trader who I would recommend to anyone - had and have full confidence in his dealings. Thanks Paul! My Husqvarna is now running sweetly after a big repair job. Paul was honest about the cost and further work that might be needed. I asked him to go ahead with the work because the old machine is important to me and he did a great job. My overlocker is the best it has ever been. Paul overhauled it and fixed it within a couple of days and also gave me valuable advice about my Bernina when I went to pick up the overlocker. I will highly recommend him for sewing machine repairs. He also has threads, needles, and refurbished machines. What a great find! Nice bloke, too!